The story of "Highway" Sanchez--bon vivant, world traveler, auctioneer--and his teeth is like Johnny Cash meets Robert Walser in Mexico. "I was born in Pachuca, the Beautiful Windy City, with four premature teeth and my body completely covered in a very fine coat of fuzz. But I'm grateful for that inauspicious start because ugliness, as my other uncle, Euripides Lopez Sanchez, was given to saying, is character forming. "Gustavo "Highway" Sanchez Sanchez is a late-in-life world traveler, yarn spinner, collector, and legendary auctioneer. 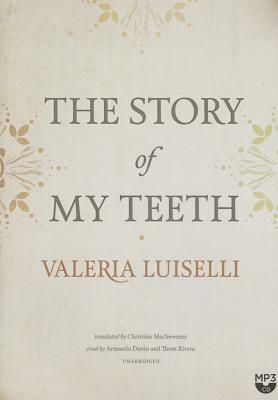 His most precious possessions are the teeth of the "notorious infamous," like Plato, Petrarch, and Virginia Woolf.Written in collaboration with the workers at a Jumex juice factory, The Story of My Teeth is an elegant, witty, exhilarating romp through the industrial suburbs of Mexico City and Luiselli's own literary influences.